Most Americans, and nearly every New Yorker, will have a strong and visceral connection to something in the new, powerful, entertaining Broadway version of Ragtime. 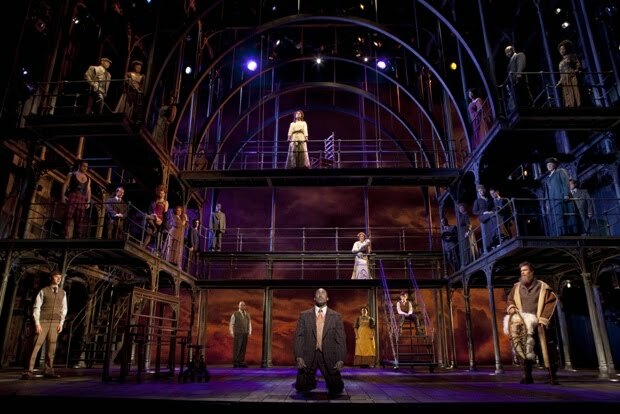 Feelings and memories stirred up while I watched Ragtime were profoundly moving for me. The story of Ragtime begins around 1902. There are three families (all fictional): an established Wasp family from the suburbs, a black family, and an immigrant family, together with many historical characters. The play selects from the characters and events in the book (the novel by E. L. Doctorow), a carefully chosen story that focuses on the developing radicalism of Coalhouse Walker, a ragtime pianist, and on the interactions between Mother (of the WASPs) and all the others. Quentin Earl Darrington -- as Coalhouse Walker, Jr., the ragtime piano player who is gradually radicalized -- sings and acts with great skill and passion. Christiane Noll as Mother sings beautifully and is just a pleasure to listen to. Stephanie Umoh, making her Broadway debut as Sarah, is just beautiful; and she has an affecting duet with Coalhouse Walker, Jr. in the second act. Christopher Cox as the Little Boy also deserves special mention. Coalhouse Walker is said to be named after a character, Kohlhaas, in an older novel by Heinrich von Kleist. Together with references to the shooting of the Archduke that triggered WW 1, these threads connect this story of a 1900’s black militant to militant radicals of all kinds throughout history. The set design is based on an attractive scaffolding which extends way up into the sky. It makes an impressive opening stage picture when the curtain rises, even drawing some gasps in the audience. There are some variations on this basic set, but no big new scenery changes ever appear. The huge cast fills the whole stage and all the layers on the scaffold, and a large live orchestra provides a rich presentation of the music. The basic ragtime music is infectious! and the other songs and music are excellent, but not particularly memorable; they hold your interest throughout the play: I would go back to Ragtime to hear the music again, ‘though I couldn’t repeat it at home. Ragtime music is a form of syncopated music that was developed around the late 1800’s. It had a recent revival (one of many revivals since its peak) when used as the theme music of The Sting. There’s a very interesting article about ragtime music in Wikipedia. Also, the seats in the theater, like so many seats in the classic theaters of Broadway are just barely large enough for a modern audience. I’m not big at all and sitting down for the first act my left pocket caught on the left armrest and ripped the seam of my pants as I sat down. So I was very careful sitting down for the second act to avoid ripping that left pocket again… so my right pocket caught on the right armrest and when I sat down I ripped the right seam on my pants. This is an old-fashioned musical (book by Terrence McNally, music by Stephen Flaherty, directed and choreographed by Marcia Milgram Dodge). It tells a story about events one-hundred years ago, staged and performed in a classic manner. 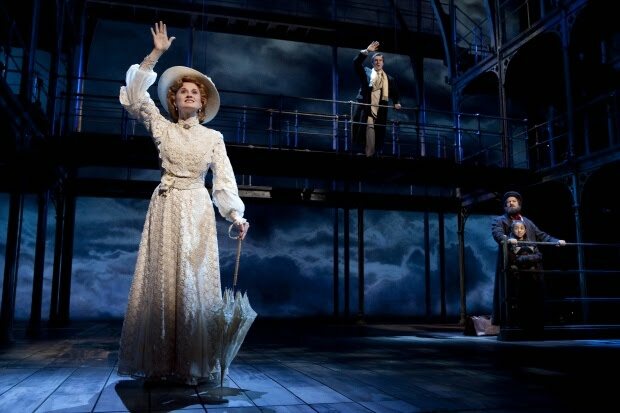 Unlike many shows which peter out in the second act, Ragtime’s second act is entertaining, moving, and hits a dramatic and emotional peak as it moves to the close. Ragtime is a perfect holiday, family show, with excellent music, a strong story, great singing, visual pleasure, and, most of all, those incredible moments when the tales of these three old American families find deep resonances in our own modern lives and histories. Dare is a terrific new indie film. It's being released Fri (11/13) in a limited number of theaters. It's about the sexual awakening of 3 high school seniors, (two boys, one girl). The film stars Emmy Rossum, Zach Gilford, and Ashley Springer, with Rooney Mara as a close friend. It was made by first timers... Adam Salky -- a guy to watch -- directed, from a superior script by David Brind. Here is an announcement from The Hamptons International Film Festival (HIFF) about their screenwriters lab. The announcement does not explain any special rules (whether you can submit more than one screenplay, for example) and it does not give a cutoff date. I guess the sooner the better. The 10th Annual Hamptons International Film Festival Screenwriters' Lab will take place April 16-18, 2010 in East Hampton, New York. Submit your script via withoutabox.com. The Hamptons Writers' Lab is an intimate gathering that takes place each Spring in East Hampton (April 16 - 18, 2010). The Lab develops emerging screenwriting talent by pairing established writers with up-and-coming screenwriters (chosen by the Hamptons in collaboration with key industry contacts). The mentors advise in a one-on-one laboratory setting while additional daily events bring the participants together with board members, sponsors, the local artistic community, and other friends of the festival. The lab allows accepted screenwriters the chance to improve their script and meet with industry professionals to help find ways to get their scripts made. Michael Cunningham (The Hours, Evening); James Vanderbilt (Zodiac); J. Robin Baitz (People I Know, The Substance of Fire); Whit Stillman (Metropolitan, The Last Days of Disco); Ira Sachs (40 Shades of Blue, This Married Life); Jeff Sharp (Producer, You Can Count on Me, Evening); Maria Maggenti (The Incredibly True Adventures of Two Girls in Love); Sabrina Dhawan (Monsoon Wedding, Cosmopolitan); Gregory Widen (Highlander, Backdraft); Mark Christopher (54); Maggie Greenwald (Songcatcher, Ballad of Little Jo); Belinda Haas (Angels and Insects, Blood Oranges); Lawrence Lasker (Sneakers, War Games); Michael Weller (Ragtime, Hair, Spoils of War); Chap Taylor (Changing Lanes, National Treasure); and Dylan Kidd (Roger Dodger, P.S.) are among the writers who have served as mentors at the Screenwriters' Lab. We seek a broad selection of screenplays addressing a wide subject matter. Additionally, in collaboration with The Alfred P. Sloan Foundation's initiative in furthering the public understanding of science, we encourage you to submit screenplays that explore science, technology, mathematics, invention, and engineering in fresh and innovative ways. Corzine lost because even though he spent a lot of money, it was on terrible ads. Spending more than your opponent only helps if your ads are any good. His attack ads were pretty convincing -- I'm worried about Christie's ethics -- but Christie's ads were very effective: they raised doubt about Corzine's accomplishments and his future plans. The trouble with Corzine's ads was that he did not address the question of what he accomplished during his term, and what he would do for NJ in another term. (He sort of did, though with little energy, at the end, but it was too little, too late.) He was almost invisible from the news. He seemed somehow tired and ready to leave office. He didn't seem to care about what he had done and what he would do. There was no energy in his campaign. Bloomberg's narrow win was a surprise, considering how much he spent, on really excellent ads. Voters seem to be tired of incumbents, and perhaps were offended by his run for a third term. If there is one thing term limits should do, it is to prevent an incumbent from changing the rules. (If the person in office can change the rules on running again, then there are no rules against running again; term limits that can be removed in favor of an incumbent are a joke, an insult to previous office holders, and not, obviously, term limits at all.) Bloomberg supported term limits in the past. Voters do not like hypocrisy -- in this case Bloomberg now supporting the end of term limits when it applies to him. The victory of the Democrat in the 23rd (NY) -- the first time, by the way, a Democrat has held that seat since the 1890s! -- indicates the problems moderate Republicans have in their own party. The Conservative was able to bump the moderate off the race in the secondary. (He did not win the primary, so if he was able to bump the other candidate after the primary, we should call it a victory in the secondary.) Democrats, moderate Republicans, and others should remember that the Conservative strategy has been for many years that it is more important to strengthen the Conservative base for a future win, than to allow moderate Republicans to win an election and strengthen their base. The old aphorisms are: All politics is local. And, "It's the economy, stupid." Here are some newer aphorisms. Incumbents need a strong economy. Republicans spend and borrow; they spend mostly on behalf of the rich. Democrats try to serve the entire population; they sometimes have to tax to pay for what Republicans borrowed. Conservatives can be more interested in capturing the Republican party than whether a Democrat wins a particular election. The presentation of high energy and the ability to inspire confidence is a great campaign strategy. Moral issues make great sound bites, but gather few votes. Moral issues generate votes even on off years; not that many votes, but "moral voters" vote consistently and dependably in most elections. The possible exception, and most important moral issue, however, is anti-hypocrisy; voters will flee from incumbents viewed as hypocritical. Defense issues are unimportant in local races, important in national races, but it's the economy, stupid.